happening in our 'music community'. Send your articles to the Webmaster for publication. 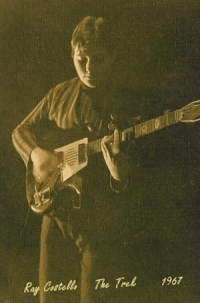 Sent in by Tony Dodd, here we have his brother Grahame Dodd who plays in a band called 'Mudslide'. Grahame also attended St Georges school and played in the 3rd Year Rugby XV Team. 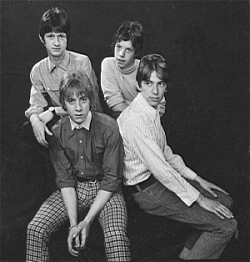 The photograph shown opposite features Grahame (centre) with fellow band members Mark(left) and John(right. 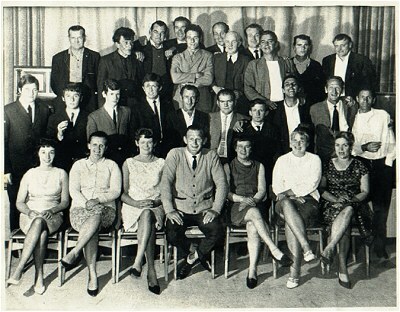 Sent in by Paul Cleary, this is a picture taken around 1968 of the Leasowe Community Charity Group. The group was made up of Mums and Dads who lived on the Leasowe Estate and whose Children mainly attended St Georges School. The group also had a number of ex pupils from the school. Pauls Dad Patrick Cleary, played the Washboard & Spoons and can be seen centre, middle row with crevat and white shirt. The Webmaster was also surprised to see himself on the Photograph (middle row far left) with Ian Chadderton standing to his left. The group toured all around the Wirral playing at venues and sported a Band, Singers, Comedians called the Leasowe NitWitts, A Glass and Fire Eater and many other entertaining acts. Lesley Swift has sent in this photograph of the band her husband Les (Thompson) played in during the early 1960's, 'This End'. Later in life Les formed a band called 'Zelda Plum'. Les is still a keen musician and still plays bass guitar. The photo was taken in The Kraal. When Ray Costello left St Georges School, he moved to Wallasey Technical College and then to AT&E in Liverpool. Ray and Ian played in Venues all over the Wirral, Liverpool, New Brighton, Bootle and became life long friends. Ray still plays guitar and keyboards and writes music with Ian. Adding to our growing musical talents we have this photo sent in by Ken Clark. 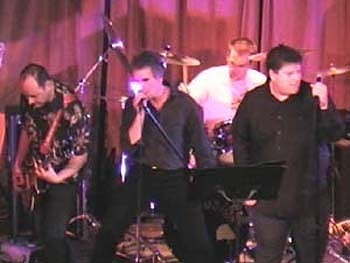 Ken is on drums and is accompanied by Tony Dodd on guitar. 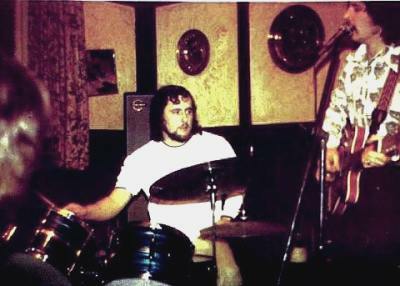 Tony is a brilliant guitarist and is seen here playing with Ken on a gig at the Nelson Pub in Trafalgar Rd Wallasey 1975. How many of you remember the clubs in New Brighton during the early 60's. Here is a picture of the Kraal Club sent in by Lesley Swift. The Kraal competed with many other clubs such as The Toledo. 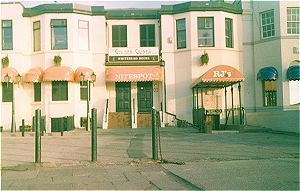 The Defiants played there along with other famous merseyside bands at the time. Zelda Plum Band Liverpool 1970 . . . . . .
How many of you remember the Cavern in Liverpool? Well, Les Thompson (Lesley Swift's husband) has sent in this banner. Later on he formed a band called 'Zelda Plum' who apparently were quite progressive for their time. Anyone out there into heavy metal rock will like the sound of Zelda Plum. Maybe you were in the Cavern when Les played there? If so, then write in and let's hear what you have to say.